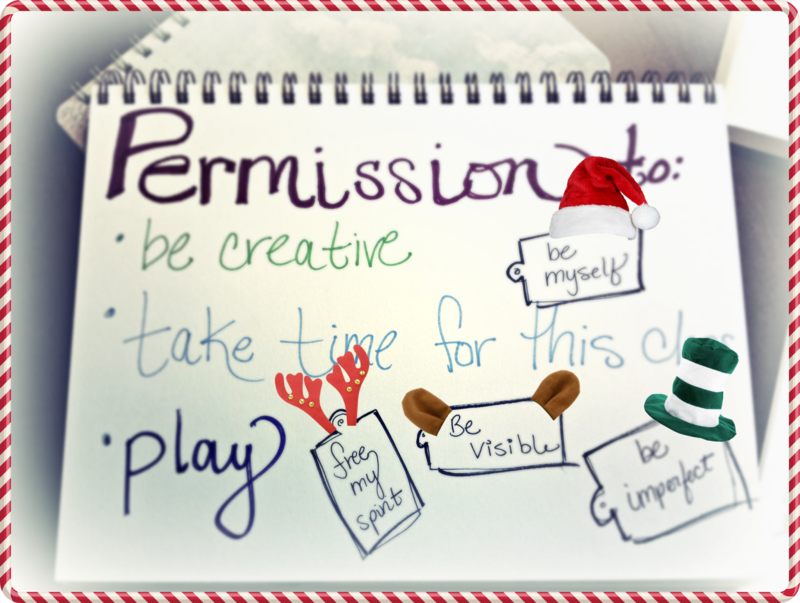 What Do You Need Permission To Do (Or Not To Do) This Christmas? Are you ready for Christmas baking season? This year I am going to be in the kitchen more because we are staying home for the entire vacation and have no company coming to visit. This is bittersweet as we may be a little lonely after skyping with our families who will be together far away in North Dakota. Still, I have a deep sense of relaxation heading into this busy time of year. One major sense of peace has been the result of my decision to forgo sending out Christmas cards this year. My cousin and I were texting about how neither of us had a family photo or the time (or desire) to get this task completed in a rush. Then I remembered the first page of my art journal from the e-course with Brené Brown. It was a page of permission slips. (see photo above ~ I added the Christmas hats to bring these permissions with me into the holidays) We were to draw slips and write down things we gave ourselves permission to feel, do, or not to do. With this in mind I suggested to my cousin that we simply give ourselves permission to take the year off from Christmas cards. She agreed and the relief we felt was immediate. It's not that I don't love sending and receiving them but there is a certain peer pressure associated with the whole thing. (I know you know what I mean so I won't go into it.) It's just that my boys are still young (11 and under) and there will never be another Christmas 2013. If I don't spend the time, money, and effort on cards, am I really letting anyone down? If someone crosses me off their list because they don't receive a card from me this year, are they sending me a card for the right reason in the first place? And now each time I sit on the couch and watch a Christmas show with my boys, I am ever so grateful that I gave myself this permission. And finally, I give myself permission to change my mind and send out Happy New Year cards in January! Who's to stop me? This cookie is one of my favorites at Christmastime. I posted it last year, but thought I would share the recipe again today. They are so easy and good. I hereby give you permission to make these yourself! 1. Cream together butter and brown sugar in a large mixing bowl. 2. Add egg yolk and vanilla and beat until combined. 3. Add salt and flour. Mix on low just until combined and dough comes together well. 5. Pop the tray of dough into the refrigerator and turn on the oven to 350 degrees. The dough can chill a bit while the oven is heating and you can clean up the kitchen. 6. Place the tray on center rack of pre-heated oven and bake for 18-20 minutes. Watch closely! If they brown too fast they will be crispy. 7. As soon as the bars come out of the oven dump entire bag of chocolate chips on top. Allow them to soften for five minutes then spread with offset spatula. 8. CUT BARS IMMEDIATELY after frosting. Once cut into squares allow to cool completely before storing. If your kitchen is warm they can go into the fridge to firm up the frosting before placing between layers of waxed paper in sealed containers. 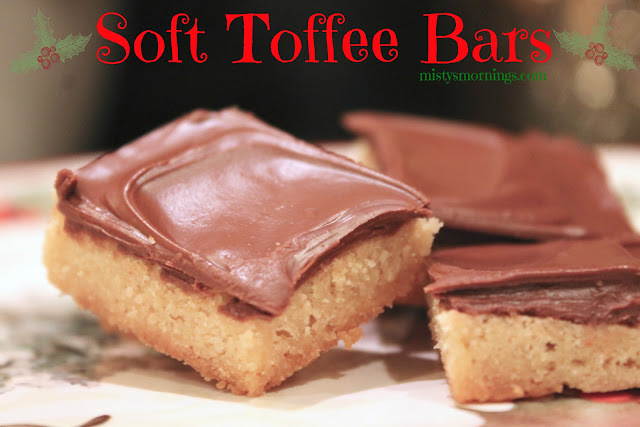 These bars keep beautifully for several days at room temp and can also be frozen for 3-4 weeks prior to Christmas. Great post Misty! We are reading Jotham's Journey at night with our prayers. It's exciting! Thanks for the encouragement Jenny!